Dr. Lisa is a doctor of the neurospinal systems. With each patient, she evaluates your spine and nervous system. This assessment allows her to see how you’re coping with the stresses of life. Once determined, we can create a plan to help you feel better and regulate their life. Specific chiropractic adjustments can assist your brain and nervous system in functioning better. In turn, your body can do the restorative repair work so you can heal. 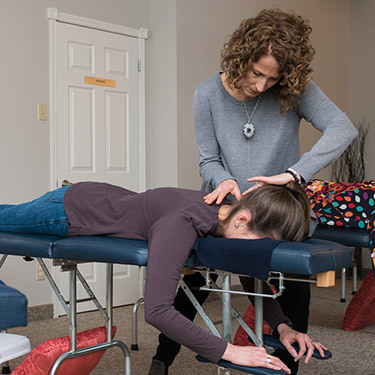 When Dr. Lisa adjusts you, she seeks to create a neurological response. Her techniques include Koren Specific Technique (KST) and Network Spinal Analysis as well as manual adjusting techniques. The goal is to create greater balance and alignment in your spine and nervous system. A care plan will be recommended based on your particular needs. After your course of care begins, Dr. Lisa will re-evaluate you and change your frequency of visits as needed. If you’ve been wanting to make a change in your life, don’t delay. Let’s meet to discuss what we can do for you. Contact us today to schedule your initial consultation with Dr. Lisa! We look forward to welcoming you to our practice.